What makes indoor air toxic? How air pollution affect our health? Indoor air pollution can trigger respiratory problems in children and adults. Air pollution kills about 50 000 people in the UK every year (about 10 000 in London alone – so about 26 people every day in London). The British government has been in breach of its legal obligation to deal with it for years now! Air pollution is the number one public health emergency now. And your home can be polluting you. You have some choice in your home. For example, most modern paints have volatile compounds that are given off as the paint dries which in the short term can give you headaches and in the long term can be carcinogenic. Choose low odour paints which are now readily available. Sieren Ernst, founder of environmental consultancy Ethics & Environment. German researchers evaluated that globally 8.8million people die from pollution every year (64 000 in the UK). In contrast, the WHO (World Health Organisation) which is a branch of the UN estimates that tobacco smoking kills 7.2million people worldwide (2015). Professor Thomas Munzel, from the University Medical Centre Mainz, a co-author of the study, said: ‘Smoking is avoidable, but air pollution is not.’ Currently, the average safety limit for PM2.5 particles in the EU is 25 micrograms per cubic metre of air which more than double the WHO recommendation of 10. “Many other countries, such as Canada, the US and Australia, use the WHO guideline,’ said Professor Munzel. ‘The EU is lagging a long way behind in this respect.” says Professor Munzel. Air pollution mainly comes from fine sooty particles from car exhausts fumes, factories and power plants. Scientists agree that reducing outdoor air pollution would save more lives than curing breast and lung cancer combined. The WHO estimates that 571, 000 breast cancer and 1.69million lung cancer patients died in 2015. There is overwhelming evidence and well-known the fact that PM2.5 particle air pollution is a major global killer and that microscopic particles inhaled increase the risk of asthma, dementia, heart disease, lunch cancer, stroke and premature birth (read below about air pollution particles found in the womb). PM 2.5 particles are tiny specks of pollutions, smaller than 2.5 microns (20 times tinier than the width of a strand of a human hair). 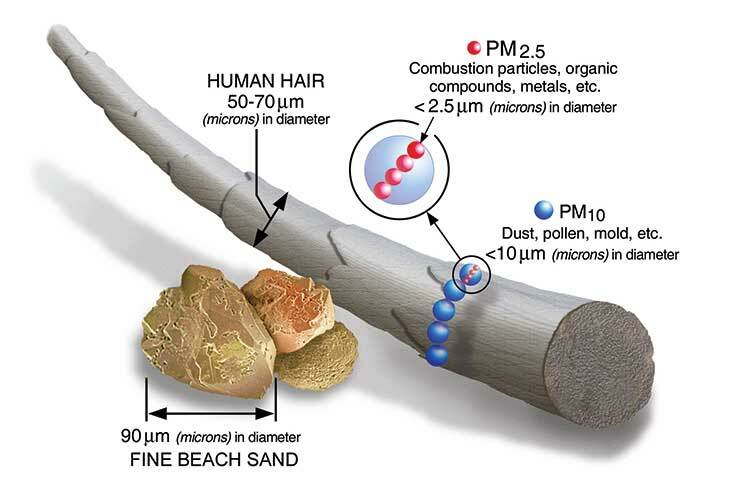 PM2.5 particles forms as a result of burning off diesel, petrol, wood and coal, which creates carbon particles. Other sources PM 2.5 particle include farming practices (grazing animals and fertilisers in agriculture give off ammonia which breaks down into PM2.5) and cleaning agents reacting with others in the atmosphere to form PM2.5, as well as a result of abrasion from tyres, brake wear and road surface friction. PM2.5 particles are dangerous because they can move through the body’s immune defences and penetrate deep into the lungs and into the circulatory system, affecting the heart and brain. Researchers found that air pollution can make people less intelligent, resulting in the equivalent of a year of education. “The effect is worse for the elderly, especially those over 64, and for men and for those with low education.” says the researcher professor Xi Chen from Yale Schoool of Public Health in the US. The WHO suggests that air pollution is responsible for seven million early deaths a year and in the UK alone, 40, 000 people die each year (in London 10, 000 people). The study has been published in the journal Proceedings of the National Academy of Sciences and was based on data from China, but it suggests that the claim is relevant worldwide since 95% of global population breathe unsafe air. Across the UK, at least five million working days are lost to pollution-related health issues every year. Dr Nay Aung, a cardiologist at the Queen Mary University of London, states that air pollution is a well-known risk factor for cardiovascular disease. Research shows that particle matter pollution is among the top five factors for increased risk fo death (heart attack and stroke are the major causes of death). Even a short exposure to air pollutants at similar levels found on roads leads to increased stress on the heart causing the reduction of the blood supply and increased risk of clots and plaque formation as well as the inflammatory stress response in the body which can trigger all kinds of harmful biological effects. A study at King’s College London shows that air pollution could be responsible for 60 000 cases of dementia in the UK and the number of people with dementia in the UK is predicted to reach 1 million by 2025. Living in polluted areas increases the risk of dementia by up to 40%. The other risk factors for developing dementia are smoking, obesity and lack of exercise. One in 14 cases of the disease could be caused by air pollution; the study says Professor Kelly, of King’s College London and a government adviser on air pollution. He also said: ‘This is a very serious problem. The more we look at all the chronic diseases in society, the more air pollution crops up as a recurring factor.” Science shows that the microscopic particles in air pollution enter the bloodstream, travel into the brain and cause inflammation – which is believed to trigger dementia. “Indoor air is more polluted typically than outdoor air and we spend 90% of our time indoors, unfortunately,” says Oyvind Birkenes, the CEO of Airthings, a Norwegian company that produces indoor air monitors. Air purifiers and monitors are big business now with sales increasing 400% in the past ten years. How is most susceptible to severe health problems from air pollution? 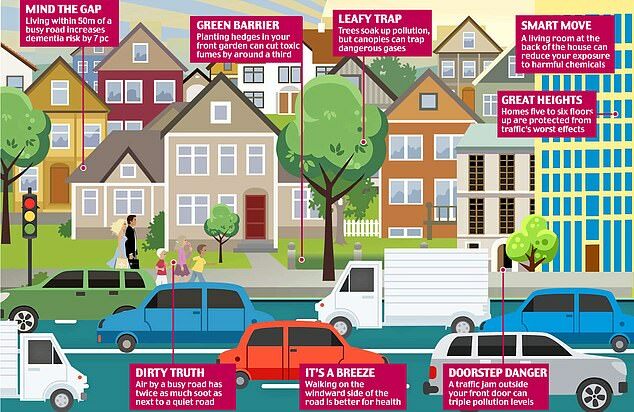 What can you do at home and outside to minimise pollution and reduce the risks? If you live on a busy road plant hedges (Portuguese laurel and privet) which will dilute pollution. Planting a hedge, tree/hedge combination or a ‘living wall’ can significantly reduce pollutants in busy, wide streets.”Planting a hedge outside your home can filter out traffic fumes at the level of exhaust pipes,” says Professor Prashant Kumar, chair in air quality and health at the University of Surrey. Professor Kumar suggests that planting ‘hedges only’ showed greater reductions in pollutants, including PM2.5, than either planting a hedge and trees in combination or trees alone. It’s important to notice if there are tall buildings on either side, trees alone only seemed to increase PM2.5 underneath. 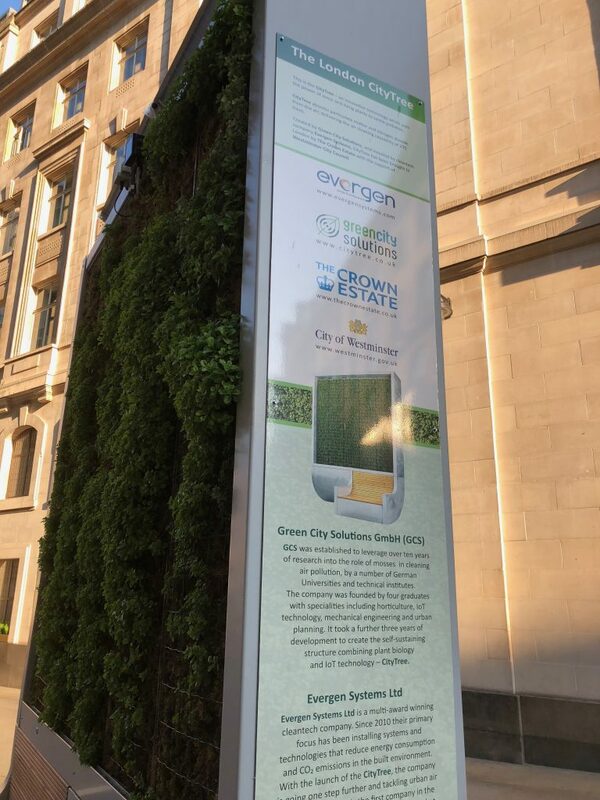 ‘Trees may trap pollutants and restrict natural movements of the flow — so in those narrow “street canyon” scenarios, it’s better to build green living walls [walls planted with vegetation] and hedges instead,’ says Professor Kumar. Researchers in Sydney (a study published in the Journal of Living Architecture) last year found that ‘bio’ walls can significantly reduce PM2.5 levels in an indoor environment. Get air cleansing plants (1980’s NASA research suggests red-edged dracaena, spider plants and peace lilies as three most effective – read more about air cleansing plants) Other research shows that ground cover plants such as iris, hemerocallis, sedum and hosta can absorb lung-blighting particles. Stop using candles, spray, etc. which usually give off pollutants. If you have to use candles, use beeswax or soy candles and although these will still give off carbon particles, it’s likely to be less than candles that are made of paraffin (which is derived from petrol). Cook with electricity, which gives off fewer emissions than gas. Ventilate your kitchen well by opening windows and use extractor fans to remove the pollutants from your home. Cooking at high temperatures, such as roasting, or making toast, releases toxic particles into the air. Studies done by Birmingham University found deep frying created the largest amount of particulate matter 20cm from the cooker and steaming the least. Also, cooking with oil rather than water contributes to higher concentrations of particles. If you lived within 100 metres of ‘green space’ or a park between your birth and when you reach 18 years – good news. Scientists at Haukeland University Hospital, Norway have shown that green spaces can offset the damaging effects of air pollution, especially asthma which affects around one in 12 adults in the UK and one in 13 in the US. Also, children who grow up in green surroundings have a 45% reduced risk of developing mental illnesses, substance abuse, stress-related illnesses and schizophrenia. The researchers suspect that this is because green spaces tend to decrease noise and pollution and when kids spend more time outdoors they develop a more robust immune system. Greener neighbourhoods also reduce stress and encourage exercise and improved social coherence. It is a well-known fact that China is struggling with the problem of heavily polluted air. “Airpocalypse” is dubbed name for smog in Beijing. No one is surprised by passers-by who wear filter masks, as well as the Cardis Hotel in Shanghai, which offers its visitors a rather unusual service, consisting of breathing extremely clean air. Hotel Cardis has a double air filtering system, and each room has its pollution sensor. It can, therefore, be assumed that nowadays, breathing with clean air is a real luxury for which you need to pay extra. Such a reality exists at least in cities like Shanghai, Beijing or Delhi. In 2014, the World Health Organization (WHO) prepared a report that informs that every year about 7 million people die prematurely due to diseases resulting from air pollution, such as lung cancer and heart attack. As you can see, there are many businesses willing to cash on these statistics. Clean air is already gaining the title of “bio” and “eco” food, several times more expensive than standard products on shelves. So far, a hotel from China is just an example, but in some time it may be the norm for the majority of the urbanised world. Oxford Street in London has the worst diesel pollution in the world. Oxford Street pollution levels are usually breached EU annual limit just a few days into a new year. Stella McCartney’s store on Old Bond Street has a clean-air hotspot regulated by a state-of-the-art nano-carbon filtration system built by the tech company Airlabs. The first step is obvious: reduce the air pollutants (see above) which includes candles or incense. Make sure that you have proper venting around combustible appliances and that the vents go directly outside as well as in your bathroom (you absorb more chlorine from showering than from drinking water because of water droplets). 5) Wear a face mask when cycling or walking in polluted areas or RepAir T-shirt made from a fabric that absorbs pollutant molecules such as nitrogen oxide, sulfur oxide and benzene (a hydrocarbon used in solvents). Or just wear cotton, which is more effective at absorbing pollutants than synthetic fibres. There are a number of air pollution monitoring apps for iPhone and Android. Measuring air pollution is the first step to improving the quality of the air. Posted in Indoor Air Pollution.